Until not too long ago, even Germans thought it was in bad taste to write about German suffering during WWII. The feeling of guilt ran too deep. I still remember the discussion when the movie Anonyma came out in 2008. It’s based on the diary of a German woman who was in Berlin when the Russian army arrived. She was one of 2,000,000 German women who were raped many times by the Russian troops. We may look at the war any which way we want, there’s no denying that the Germans suffered too. We just have to think of the bombing of Dresden, the mass rapes of German women by Russian troops and – of course – the huge number of people who were forced to flee from the East towards the West, when the war was lost. Many of these Germans would never be able to return because the place they came from wouldn’t be part of Germany anymore. 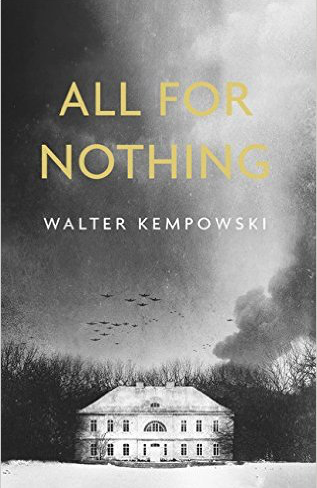 This may seem a lengthy introduction but it’s essential to understand not only the importance but the scope of Walter Kempowskis’ powerful and chilling novel All For Nothing – Alles umsonst . 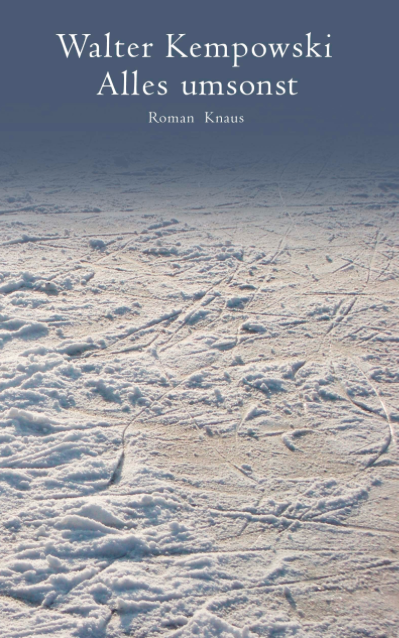 All for Nothing is set in East Prussia, in the winter of 45. In January, to be precise. The story mostly takes place on the Georgenhof estate, located near Mitkau, not too far from Königsberg. Königsberg which was once famous was almost completely destroyed and is now called Kaliningrad. For further understanding, I’ve added two maps. 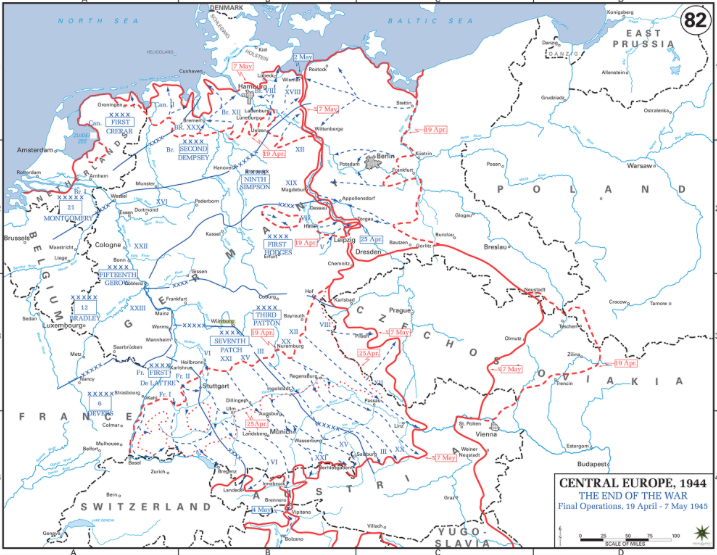 The map above shows East Prussia in red. The other one below, is a map from 1945. It is more detailed and shows other territories. It’s easy to understand when you look at the maps, how precarious the situation was for the civilians in East Prussia when the Russians started to advance. At the beginning of the novel, people already start to flee in the direction of Berlin, only the people on Georgenhof, the von Globig’s, behave as if nothing was happening. This is mostly due to Katharina von Globig’s character. She’s the wife of the estate owner who is serving in Italy. Together with her twelve-year-old son, her husband’s elderly aunt and Polish and Ukrainian servants, she lives a life of carefree ease. She’s someone who likes to withdraw from the world, into her own realm. She lives in an apartment inside of the large estate where nobody is allowed to enter. Here she reads, dreams, smokes, cuts out silhouettes, and thinks of an affair she had some years ago. Possibly the only time in her life in which she was really happy. The aunt is a typical old maid. In the absence of her nephew, and knowing how little Katharina cares, she is in charge of the estate. Peter, the son, who should be with the Hitler Youth, pretends he’s got a cold and, like his mother, flees to other realms in his imagination. When the first refugees arrive, the small household welcomes them. They feed and entertain them, just as if they were ordinary guests. Katharina may be distracted but she’s kind and generous. Even though her husband calls her occasionally and urges her to leave, she stays put. But some of the refugees tell horror stories and even Katharina and the aunt realize that falling into the hands of the Russians might prove fatal. Only their life is so comfortable, so enjoyable, how can they leave everything behind? This is an incredible dilemma, and one can easily understand how so many waited far too long before they finally fled. In the case of the von Globig’s it needs a tragedy that finally pushes them to make a decision. The first half of the book tells the story before they flee, the second half, tells the story of the flight. It was so strange, but reading the first almost peaceful part was really stressful. The reader knows what’s coming but the character’s don’t. It takes so long until it sinks in that all is lost. The descriptions of the flight, those long, endless treks of refugees is harrowing. Not only are the Russians pushing forward, but the refugees are bombed and dead people and horses are piled up to the left and the right of the roads. Kempowski did a great job at describing in a poignant way how this must have been without traumatizing the reader. We read, breathlessly, but it’s not too graphic and the characters are held at arm’s length. That doesn’t mean the book left me cold. Not at all but it never felt like it was manipulative and trying to shock and disgust. People often say “Why didn’t they leave earlier?” when speaking of people who are trapped in a war zone. When you read this, you get a good feeling for the reasons. Not only do they have to abandon everything, but they have no idea whether it will be better where they are going. Besides, back then, all they had was accounts of a few other refugees and British radio. Their own radio told them that it was negative propaganda, that all was well, the frontline still secure. How would you have known for sure? The luckiest thing may have been that they fled back to their own homeland and could stay on territory in which their own language was spoke. While many didn’t make it and many had a very uncertain future, they had at least that. Unlike the refugees that come to Europe from the war zones in the Middle East. Before ending, I’d like to say a few things about the characters and Kempowski’s style. He does something I’ve never seen before. Almost every other sentence ends in a question mark. It’s really bizarre and I’m surprised it didn’t annoy me. Interestingly, it felt like we hear the characters question themselves all the time. I read a few reviews and apparently he tried to show the general confusion. I’d say he was very successful but it takes some getting used to. His characters are very well drawn. Even minor characters come to life. Most of the time he uses indirect speech but you can still hear the different mannerisms. People repeat the same stories again and again. Just like in real life. Sometimes that’s quite funny. People can be so absurd. Petty. Self-absorbed. Ridiculous. Under the circumstances it’s tragically comic. As I said, Kempowski keeps the reader at arm’s length, that’s why there isn’t a character I loved but there were two I genuinely disliked. One of them was Peter. I would love to know if anyone who read this had a similar reaction. The more I approached the end, the more I disliked this kid. Such a cold fish. I’m so glad that I chose this novel for the readalong because it’s not only powerful but important. It tells a story that needed to be told and does so masterfully. Raising awareness for a tragedy, making characters come to life on the page, but not bang your readers over the head or traumatize them – that’s no mean feat. All For Nothing is the fifth book in the Literature and War Readalong 2016. The list for next year’s Literature and War Readalong will be published in December. Further information on the Literature and War Readalong 2016, including the book blurbs can be found here. This sounds like a book well worth reading. Those who study the later days of World War II in Europe know something of the horrors that The Germain also people suffered. For me, I first became aware of these things from the still excellent The World at War documentary series. I’ve never watched that series. I think I should. I think others wrote about it first but it was considered in dubious taste from German authors. I bought this one last year, I think and I know I’ll really enjoy it when I get to it. I think you will. You’ll enjoy the character descriptions. It does indeed sound like a very powerful read. As you say, it takes real skill to portray a story of this nature without it coming across as too blunt or distressing. Thanks for the introduction as it helped to put the story into the broader context of the developments at the time. It is powerful. He’s widely read and famous in Germany, I can see why now. I’m glad the info helped. I read this at the beginning of the year and thoroughly enjoyed it. I really appreciate the context you’ve provided in your review. I’m quite interested in reading his Swansong 1945 now. I’m glad to hear you liked it too. It’s so good. The context is important. 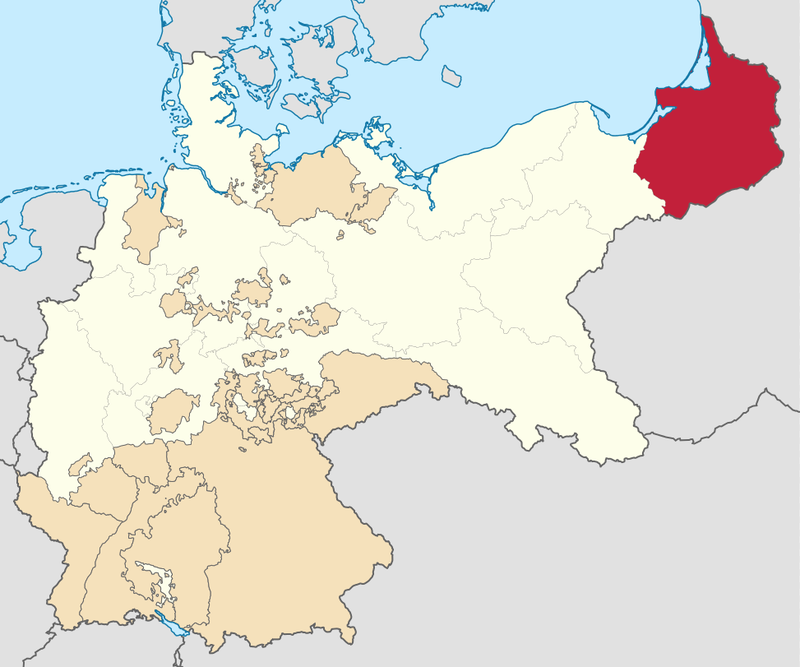 I forgot how far away from central Germany East Prussia was. I have another if his books. One before Swansong. What a great review, Caroline. I’m definitely adding this one to the future reads pile. That is strange about the question marks, but I like when writers do something new and original. Thanks, Carole. I’m sure you will like it. Let me know. The question marks are bizarre but the technique works. This is such an important book and I am glad you chose it for November For the research for my own books I concentrated on the Allies side of the war and it was good to be reminded of what was happening in Germany. Because I knew that Kempowski was writing about events from his own lifetime and the events he’s witnessed his fiction had an authentic feel. Unlike you, Caroline, I became concerned about what was to become of Peter. I didn’t find him cold. He seemed to me to be very like a nearly teenage boy who is preoccupied with his own life. I think his lack of warmth was due to growing up with an absent father and an absentee mother and being raised by servants and a spinster aunt – probably typical of aristocratic families and not just in Germany. I also wondered if Peter’s situation reflected some aspects of Kempowski’s life. I liked the way that Peter kept hold of his microscope and that once they were on the road he made up stories to try to impress the people he met. I found his mother irritating although I think that as a reader you are supposed to want to give her a shake and to tell her to wake up. She is fundamentally decent though as evidenced by the household taking in refugees and her deciding (one of her few decisions) to provide shelter for the Jewish man. The book gives the impression that although everyone knew about the treatment of the prisoners in striped uniforms they either pretended not to see it or, after a decade of being told that there people were evil they accepted it as appropriate. That is rather a frightening thought given the current rhetoric in the UK and USA. I could go on at length but I’ll pause now. I’m so glad you liked it as well and I certainly agree – very important. Book sfrom WWII and the German’s view, unfortunately ring so true in these days. We can read them as a warning. I knew abot the Heil Hitler Gruss as I’ve seen many German TV series and it’s always shown also to underline that not everyone said it. Have you seen the long mini seies Klemperer? It should be available in English. Or, I hope it is. If you don’t know Klemperer – he was a Jewish professor and wrote a huge diary. The series is based on that. This was a very intelligent may. Highly educated and not very religious and almost to the end he believed things weren’t as bad as he thought. I liked that we learned what happened to all of them. You are right. Peter’s parents were largeldy absent, so that could explain why he’s so self-centered. I just think a child would show some emotion and/comapssion. Seeing so many killed. Dead animals and people – but no. I liked Katharina to soem extent but it’s hard to imagine that she just looked the other way pretending nothing was going on. I really think it’s a marvellous book. Wow, this sounds fascinating. I’ll have to look for it! Yes, it is. I hope you’ll like it as well. It’s so well done. Thank you, Resh Susan. There are a few but not all that many. It’s quite eye opening. And sad. A very dear elderly friend lived in East Prussia and had to flee the Russian advance. It was a total nightmare and after much hardship, including becoming separated from some family members in the chaos, she and her parents ended up being homeless and stateless. She has told me many times about how people kept their daughters locked inside, because otherwise they’d be raped by marauding soldiers. She remembers the shock of having to run away with only the clothes she was wearing and leave everything else behind, and the pain of never being able to go home again. The trauma of her war experience has never gone away, even though she migrated to Australia in the 1950s and made a new life here. This sounds like an interesting book. I’ll have to see if I can track it down. It’s a very interesting book. Your friend’s story is so tragic, yet so typical. There are a few German mini-series – not available in English – in which you see Germans living in the country side, bracing themselves for the arrival of the winning troops. I remember scenes when they were standing at the windows, waiting for someone who’d gone looking and they all shouted is it the Russians or the Americans. In the first instance they ran, in the second they rejoyced. It’s sometimes said in Russia that this is only negative propaganda but I’m pretty sure, it’s accuarte. It must have been THE nightmare for a woman to fall into Russian hands. Mind you, the Germans slaightered them, nonetheless . . . So horrific. This seems like an important read, educational also to those who, like me, don’t know much about the German side of things during the war. Thanks for the review! You’re welcome. I’m glad to hear you found it interesting. It is an important book. I think it helps to understand the mindset and what Germans had to endure. I will get back to this and finish–so glad you thought so highly of it. It did seem like quality literature and the writing was lovely. It was a huge surprise. I didn’t expect it to like it so much. I hope you’ll give it another try.